As expected, Sprint's Boost Mobile unveiled new Data Boost promotional plans today that double the included high speed data and are $5/month cheaper than the Boost's equivalent regular plans. The new Data Boost plans are only available until Nov. 3, but customers who switch to one before that date get to keep them indefinitely provided then keep their account active and don't change plans. Current customers can switch to one of the new plans using the My Account page on the Boost Website. As always with Boost, streaming video is throttled to "3G" speeds which on the Sprint network probably means 3.1 Mbps at most. After the high speed data allowance is used up, data speeds (including streaming media) are throttled to just 128 Kbps. I expect that Boost's new promotion will trigger a round of price cutting by the competition, especially T-Mobile's MetroPCS . Even before the new Boost plans were leaked, Metro was rumored to be bringing back the 4 lines for $100 promotion as well as increasing the amount of high speed data from 500MB to 1GB on the $40 plan and from 2.5GB to 3Gb on the $50 plan. I wouldn't be surprised to see MetroPCS go even further to match or even beat Boost's offer. Eventually I expect all four major operators to be drawn into a new round of price cutting. While good for user in the short run, the new prepaid price war is going to be hard on the MVNOs who will be hard pressed to match their network operator partner's own plans. MVNOs have been responsible for much of the value and innovation in the prepaid industry. If MVNOs can't survive, prices will ultimately rise and consumers will lose. Hopefully the operators will cut their wholesale prices to allow the MVNOs to compete. I was thinking that 3g wasn't too bad, I have 8 Mpbs on my 3G Tmobile phone and video is fine. 3 Mbps might buffer more. It's really interesting that Boost wants to be competitive now. Please let VM be next! Switching from T-Mobile 3G to Sprint 3G is a major downgrade. T-Mobile's 3G is HSPA+ which is almost as fast as LTE. Sprint's 3G is slow EVDO it runs at around 1Mbps on a good day. seems good but where I am Sprints network is the worst of all the networks and it's just not good enough for them to sway ME over. For those that ARE in a good Sprint area... this seems to be a deal to jump on! Good to see at least Sprint is trying again. But they'd better work on their network too. As many as there are that complain about that I think they would make it a priority. Lets hope so.
" But they'd better work on their network too." Yes, at some point, you need to realize that a cheaper and cheaper Yugo is still a Yugo. Dropping the price does not turn it into a Toyota. This would be great if they were permanent and Dennis there's a rumor that the new metro pcs plans with more data will be going live tomorrow, have you heard anything? The rumor has MetroPCS bringing back the 4 lines for $100 promotion as well as increasing the amount of high speed data from 500MB to 1GB on the $40 plan and from 2.5GB to 3Gb on the $50 plan. But I wouldn't be surprised if MetroPCS went even further to beat Boost's new promotion. What's the difference between this and Virgin? other than price? 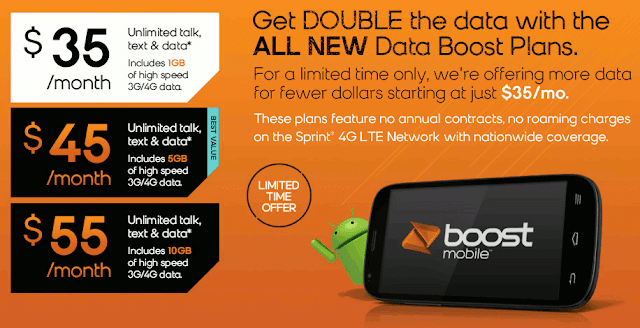 And are loyal long term Boost customers screwed out of this deal? Read, it's for new and existing customers. And does Boost have roaming? Now if they would allow useable hotspot. $5/day for hotspot is ridiculous but how is it not usable? Lol I heard that one! That is my main inhibitor. Where is Cricket in all this? Cricket has 5 lines for $100 but only 500mb each. The HAVE to match the 1GB allotment for the basic $40 plan!! They don't have to, At&t is in a lot better shape than underdog Sprint. geez. "me too! me too!" it's the stupid me-too factor. just because puny itty bitty little boost did it, doesn't mean the at&t cricket bugheads or anyone else will do it. go port to boost if boost has coverage in the area where you use your phone. otherwise, forget it if boost is no good in your area. How much, from a single line customer perspective, does the Boost $35/45/55 'All You Can Eat' (with measured data 'dessert'), truly leave for any MVNO's to price innovate when offering Unlimited Plans? There only seems to be lower pricing available if you are willing to product differentiate ie: Republic, offloading to WiFi ; Ting with 'measured' service ; Virgin Custom's add on roaming ;multi-line pricing. The main opportunity for MVNOs now seems to be with non-unlimited plans including Ting/VM-custom style plans and competitively priced pay as you go plans. Very few people really need an unlimited plan, why pay for more than you use. For a modest user Virgin Custom is $36 [$35.98 for 500 minutes, 500 text, 1GB data]. 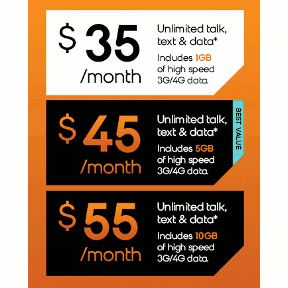 Cut the data in half, to 500mb and you're at $31 (save $5). Doesn't look like there is much room left to significantly lower prices of non-unlimited plans, as the base price is $7/month for the 20min /20txt /0data plan. Boost touts roaming on its site. No they don't. They say "no roaming charges" but that's because there's no roaming to charge for. Boost and Virgin don't throttle video streaming to their maximum 3G speed. It's throttled to only 600Kbps. The new Boost plans do. They do mention a lot of specifics about them HAVING roaming in the TOS in their own site, but this is hardly touting. The $50 MetroPCS plan now included 3gb. Rumor confirmed. MetroPCS has doubled the data to 1gb on the $40 plan and brought back the 4 lines for $100 promotion. I would like to see them offer mulit-line discount ("group plan" ). Still, unlikely that I would use them because of slow data speeds and coverage holes in my area as well as of byod.